This Sno-Cone concession machine is perfect for that hot summer day or even as just a snack for your next event! 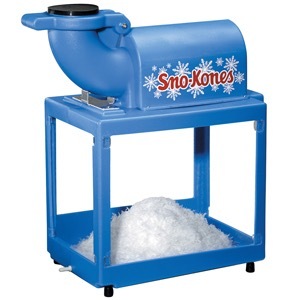 Our snow cone machine crushes ice with ease to make the perfect sno-kone. ACP does NOT provide the ice. A cleaning charge of $30 will be automatically billed when booking this concession machine. The $30 charge will be refunded to you if the machine is returned clean. Cleaning instructions can be found by Clicking Here.